iCliniq › Ask a doctor online › Answers › Spine health › Scoliosis Surgery › I have severe pain eight years after a scoliosis surgery. Could something be wrong? Q. I have severe pain eight years after a scoliosis surgery. Could something be wrong? I underwent scoliosis surgery eight years ago and have been experiencing a pain around my left shoulder blade. Recently this pain has gotten so bad it has become difficult to even breathe and sleep. Is it possible something is wrong with the rods that were placed during the surgery? 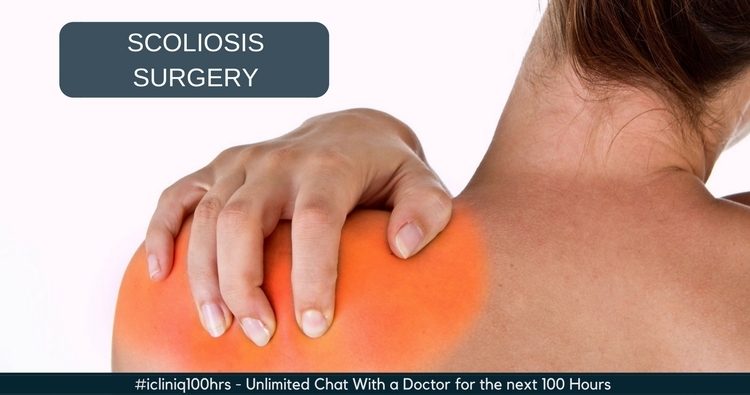 • Can scoliosis get corrected through surgery? • Should I get a bone marrow biopsy to rule out possible MPN? The segments adjacent to the one that was stabilized may sometimes start to misbehave due to abnormal loads. As it has been eight years since surgery, the likelihood of an infection and loosening are less likely, though it cannot be completely ruled out. You need to see your doctor and repeat the X-rays and the blood work to rule out the possibilities. I run out of breath while taking stairs. What is going on?